Jordan Boats supply CNC-cut plywood boat kits that eliminate the worst fear of the trepidatious amateur - that you will cut totally the wrong shape and not realise until it is attached to the rest of the boat with the glue rapidly hardening. 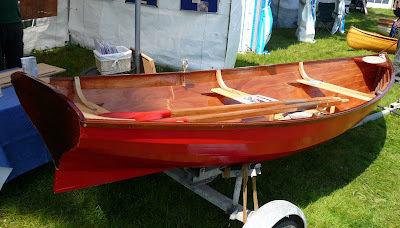 Alec Jordan had a lovely Acorn 12 skiff built from one of his kits by John Baddeley outside his stand at Beale Park. 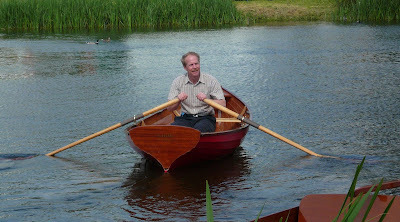 Designed by Iain Oughtred, she is light and slim, and sits delicately on the water. Here is Alec claiming exhibitor's rights and getting a bit of a paddle in.